The MyAT&T App Isn't Working On My iPhone! Here's The Real Fix. You are at:Home»iPhone»Apps»The MyAT&T App Isn’t Working On My iPhone! Here’s The Real Fix. You’re trying to connect to your myAT&T account from your iPhone, but something isn’t working right. 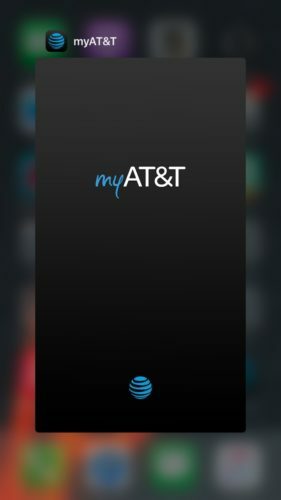 The myAT&T app allows you to connect to your account on-the-go, but it doesn’t always work as expected. 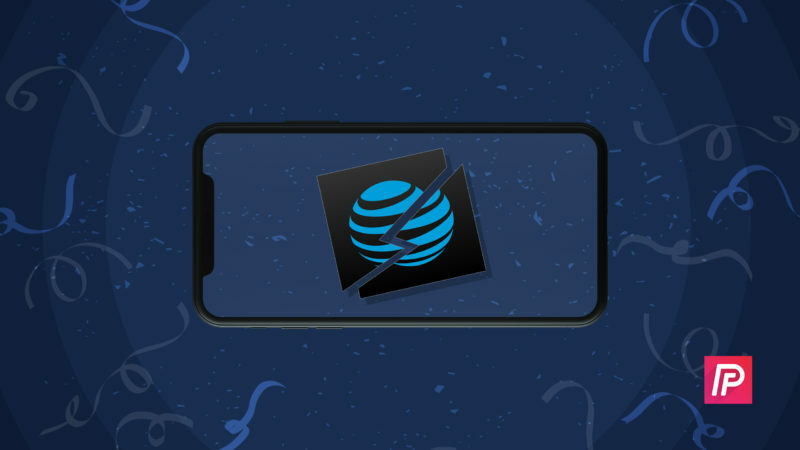 In this article, I’ll explain why the myAT&T app isn’t working on your iPhone and show you how to fix the problem for good! The first thing to try when the myAT&T isn’t working on your iPhone is to close and reopen the app. It’s possible that the app has crashed, causing it to stop working. Before you can close out of the myAT&T app, you’ll have to activate the app switcher. On an iPhone 8 or earlier, double-click the Home button to open up the app switcher. On the iPhone X, swipe up from the very bottom of the screen to the center of the screen. When your finger reaches the center of the screen, pause for a moment and the app switcher will open. On your iPhone 8 or earlier, swipe the myAT&T up and off the screen to close it. On your iPhone X, press and hold the myAT&T app preview until a red minus button appears in the upper left-hand corner of the app. Then, close the app by either tapping the red minus button or swiping it up and off the top of the screen. If closing the myAT&T app didn’t work, try restarting your iPhone. It’s possible that a different app stopped working, causing your iPhone’s software to crash. 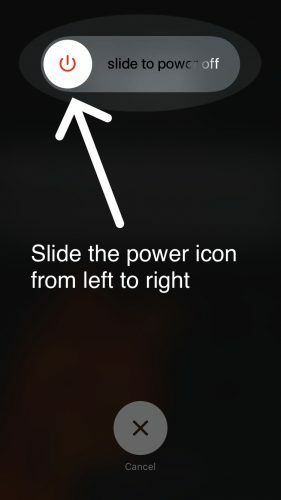 To turn off your iPhone 8 or earlier, press and hold the power button (also called the Sleep / Wake button) until slide to power off and the red power icon appear on the screen. Then, swipe the red power icon left to right to turn off your iPhone. The process is similar on the iPhone X, except you press and hold either volume button and the side button until slide to power off appears. Wait 15 – 30 seconds, then press and hold the power button (iPhone 8 and earlier) or the side button (iPhone X) to turn your iPhone back on. Let go of the button when the Apple logo appears on the display. If the myAT&T app isn’t working after you’ve restarted your iPhone, we can problem rule out a minor software glitch. The next thing to do is check to see if an app update is available. AT&T frequently releases updates to their app in order to fix glitches and introduce new features. To check for an app update, open up the App Store and tap the Updates tab at the bottom of the display. Look for myAT&T app under the list of pending updates. If an update is available, tap the Update button to the right of the app. If no software update was available, it’s time to troubleshoot for a deeper software problem with the myAT&T app. To do this, we’ll uninstall then reinstall the app — this will give it a completely fresh start! 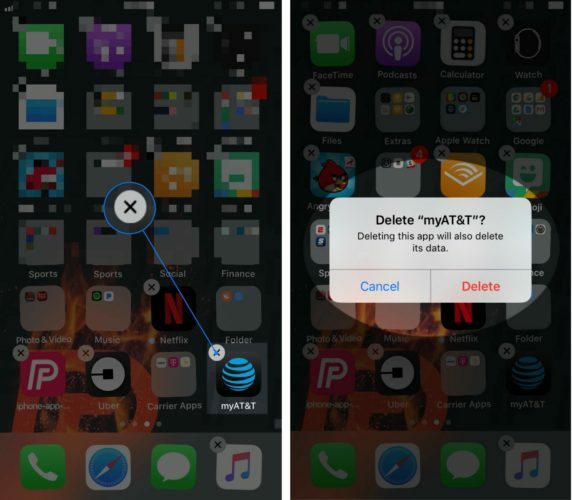 To delete the myAT&T app, press and hold the app icon until your apps begin to jiggle and small X appears in the upper left-hand corner of the app icon. Tap the X, then tap Delete when the confirmation alert appears on the center of the screen. Now that the app has been deleted, go to the App Store and find the myAT&T app. When you’ve found it, tap the download button to its right. Since you’ve installed the app before, the download button may look like a small cloud with an arrow pointing out of it. A small status circle will appear after you’ve tap the install button. 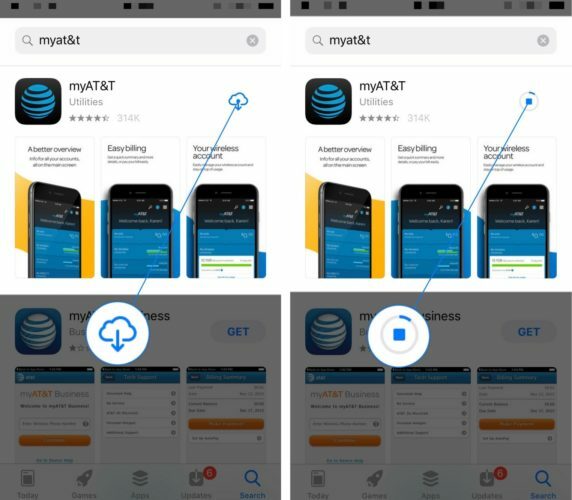 If you’ve reinstalled the myAT&T app, but it’s still not working, there may be a problem that can only be solved by AT&T’s customer support team. You can reach their customer support team by calling 1-800-331-0500 or visiting their Contact Us page. You can also quickly reach a representative by sending a tweet to @ATTCares on Twitter. You’ve fixed the myAT&T app on your iPhone, or you have a great option for contacting a customer service representative. Make sure you bookmark this article so you’ll know what to do the next the myAT&T isn’t working on your iPhone! If you have any other questions, feel free to leave a comment down below. Previous ArticleMy Sprint App Not Working On iPhone? Here’s The Fix! Next Article My Apple Watch Only Shows The Time! Here’s The Real Fix.